That New Jersey has high taxes isn’t news, but for years, it has been dismissed by some policymakers. Wednesday’s Rutgers-Eagleton poll, done in conjunction with NJBIA, should put an end to such a lackadaisical attitude. It showed more than 80 percent of residents saying taxes are too high and they are not getting their money’s worth in government services in return. “Our overburdened residents and businesses are sounding the alarm that they have had enough and don’t feel they’re getting high value for what they pay,” said NJBIA President and CEO Michele Siekerka. 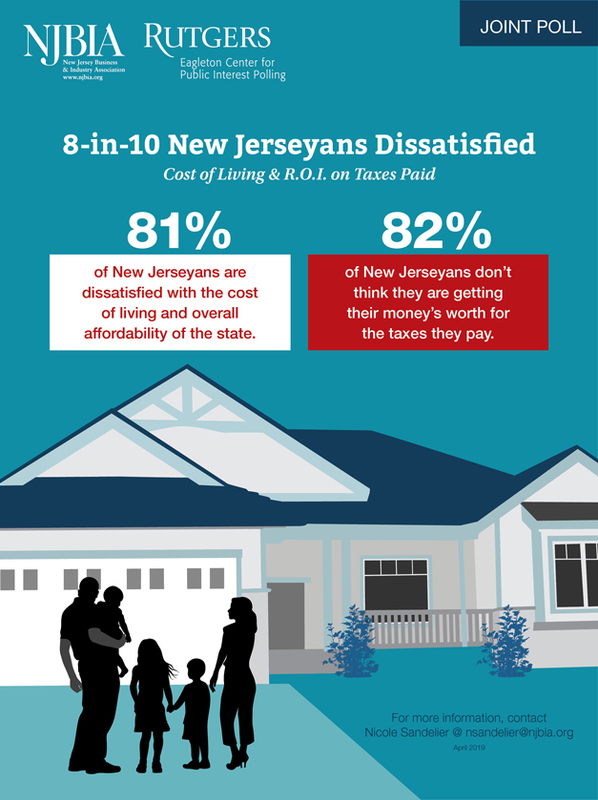 “New Jerseyans across the board – Democrats and Republicans alike – continue to be upset with what it costs to live in this state, what the government is doing about it, and with the idea of any new taxes,” said Ashley Koning, director of the Eagleton Polling. Some policymakers are heeding the call. “New Jersey has become so unaffordable, people are being forced to leave the state that they were born and raised in,” said Assemblyman Anthony Bucco. “The constant tax and spend policies of Trenton have to be reversed. If they’re not, we’ll go further and further down this dark hole,” he said. “Eighty-one percent of respondents said they are somewhat or very dissatisfied with their government’s efforts to address the cost of living and affordability. Not exactly a recipe to attract and keep jobs and families here,” said U.S. Rep. Josh Gottheimer (D-NJ), as he announced plans to sponsor legislation reinstating full SALT tax deduction on the federal level. “Eighty-two percent of New Jersey residents already believe that they’re paying too much in taxes,” said Assembly Republican Leader Jon Bramnick. “That’s in direct opposition to the Murphy policy of raising taxes by billions of dollars. 52% are dissatisfied with the business and employment opportunities here. New Jersey is being controlled by an assortment of Public Sector lobbyists at the expense of the taxpayer. The Public Sector employees have gold plated healthcare and retirement benefits. The Private Sector Employees have minimal health care benefits and 401k retirement plans. Private Sector employers have cut back on benefits due to competition (and greater life expectancy). It is long overdue for the Public Sector to take steps to provide a level playing field for all employees. as a owner of a business that employs over 125 full time workers im fed up and planning to relocate my business out of New Jersey if something is not done in the next 2 years. NJ has become unaffordable and we plan to leave as soon as we stop working. Virtually every single resident I have spoken to agrees, and the possibility of a mass exodus like this state has never seen is coming. There is no way we get enough value in state services – absolutely not true, plus I understand NJ gets back one of the lowest returns for every dollar we send to Washington. This has got to stop! We voted in a Harvard MBA who believes there is an optimal level of continuous social spending coupled w increased taxes and additional state administrative “fees” that will arrive a satisfactory solution. Murphy and his cronies need to go. They are relentless and will pick your pocket, until it is empty. He is not familiar with the term “fiscally prudent” or “free market”. He is a progressive socialist, as is evidenced by his exuberant over taxation, over regulation and inability to reduce out of control cost. These policies are unsustainable and when we experience an economic downturn, the results will be disastrous.